Three nurses who qualified at City Hospital 50 years ago were rolling back the years as they toured the place where they completed their training. Christine Bannerjee, Anne Cieslicki and Susan Thomas all qualified in 1963, the day after John F Kennedy’s assassination, and went on to have long careers in nursing. They took the opportunity to meet the Interim Chief Nurse Linda Pascall, ward matrons Sharon Reynolds, Julie Romano and Justine Irish and Practice Placement Sister Charlotte Street with two third year students. 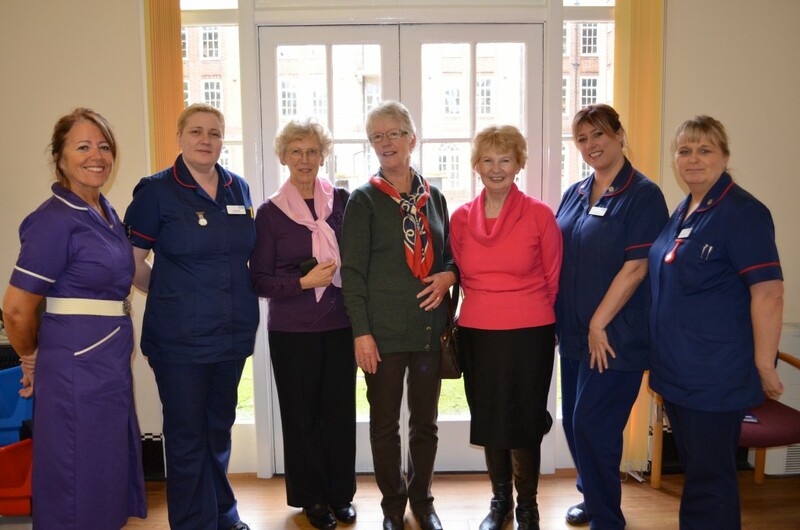 The ladies had a look around ward D25 and met for coffee in the Anne Gibson Board Room, where they were presented with Bronze Nursing with Pride badges, which are awarded to nurses who have demonstrated their competence in care. Lots has changed over the last 50 years at the hospital, formally known as Dudley Road Hospital. Christine, from Portsmouth, said: “You can see the progress in recognising modern technology which is remarkable from what we had. The wards have changed dramatically from the 36 bed wards the ladies used to manage in teams of two or three. Now the wards have more staff and the help of a considerable amount of technology to help with patient care. As well as her long nursing career, Christine also set up the Rowans Hospice in Portsmouth in 1972, which raises £4 million a year to serve the community in Hampshire.